Over the past decade, the rise in popularity of “smart beta” investing has provided retail investors with more advanced options for reaping the returns of stocks with specific characteristics. Like all investment vehicles, smart beta funds should be approached with caution and used only by those who have properly planned for and researched these strategies. For retail investors, this means having an understanding of the processes underlying the various “smart-beta” investment strategies, and using all available options to build portfolios that are low-cost, diversified, and aligned with their goals as investors. While pouring through stock returns over the past half a century, researchers found a relative handful of “premiums” or “factors” that explained a great deal of the variation in diversified portfolio returns. As a result, they developed models to explain the returns accordingly. 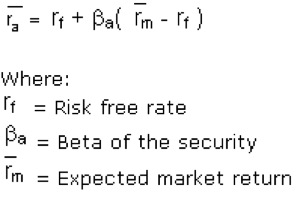 In this equation, "beta" compares the returns of an asset to the “market premium” (Rm-rf) – the return investors received for investing in stocks instead of bonds. Beta helps investors understand how much of the return of an investment portfolio is explained simply by its exposure to the market premium. Stock returns would receive further explanation in the early 1990s when researchers Eugene Fama and Kenneth French developed the Fama-French Three Factor Model. With the addition of two more premiums, one for small company stocks, and one for low relative price (or “value” stocks), the Fama-French Thee Factor Model explains closer to 95% of the returns of diversified stock portfolios. Since then, various asset pricing models have grown to include even more factors, many of which have already made their way into the evaluation of smart beta funds. Instead of trying to actively manage and outperform the market (alpha), investors can now target higher portfolio returns by passively investing in areas of the market that have historically provided investors with a premium for investing in them (beta). It’s important to note that this isn’t a free lunch; risk and return are related, and the increased returns of certain areas of the market usually go hand in hand with a higher level of fluctuation. Investors should exercise caution and do their research before investing in Smart Beta funds in order to understand the risks and the rewards. If the purpose of smart beta funds is to deliver the returns of a specific area of the market, it is important to understand what these funds attempt to accomplish, and how they are designed structurally to do this. The targets of smart beta funds are generally the “factors” or “premiums,” identified as a result of academic research. In the last decade in particular, there has been an explosion in the variety of smart beta funds. There are now value, size, momentum, (low) volatility, liquidity, and quality varieties of smart beta funds. Part of what makes the different varieties of smart beta funds hard to sort through is that there are often multiple names for essentially the same premium; “quality” and “profitability” are the same, and “momentum” is sometimes called “trend." As a retail investor, you should look through the research supporting any factor you are considering, and make sure you are well-versed in the names and terminology of the funds. The robustness of the research behind the factors that these funds target is varied; some have been studied rigorously for decades, while others are relatively new to the scene. In contrast with traditional index funds and ETFs that passively hold everything in proportion to market weights, smart beta funds shift their weighting scheme to target a certain factor. Though they still use a passive, rules-based management approach, they will apply certain screens based on fundamental or technical characteristics, or will overweight certain companies to target the higher expected returns associated with a particular factor. It's essential to understand the factor or “beta” being targeted, and the investing rules the fund will use to deliver the returns of that asset class, so you can develop appropriate expectations for the investment and understand how it fits into your overall portfolio. Since smart beta funds are targeting different areas of the market, their returns will vary widely compared to the most commonly reported stock market benchmarks, like the S&P 500. Investors in smart beta funds should prepare themselves for not just years, but decades, of a single factor or smart beta fund underperforming a simple market-weighted index portfolio. When using smart beta funds to build an investment portfolio, it's imperative to diversify across asset classes and within asset classes. Diversifying between asset classes or factors is important because it prevents the performance of a single factor from derailing your entire investment portfolio. Though it may be tempting to focus all your efforts on one factor, this is a dangerous market timing game because nobody knows what future returns will be, or what the top-performing asset class or factor will be over the next period of time. This is a risk that nobody should take, no matter how experienced they are as an investor. It's also important to make sure the smart beta funds themselves are diversified. The returns associated with a particular factor or beta tend to be driven by a handful of companies with strong performance, but there is no way to know in advance what will perform the best. The only way to make sure that you own the companies that drive the returns of a particular asset class is to diversify as much as possible within that asset class. With smart beta funds, as with any investment, it is important to be aware of all costs associated with the fund. As an investor, you receive the returns minus your costs. With smart beta funds, the primary costs are the expense ratio – how much a fund charges you to invest – and turnover – how much buying and selling the fund is doing. Both costs are a drag on performance, and any additional costs incurred by a smart beta strategy are an additional hurdle rate when it comes to delivering the returns of that factor. Only target specific factors if you can do so in a reasonably cost-effective way; it doesn’t make sense to spend two dollars in costs to earn one dollar of extra return. Your objective as an investor is to grow your wealth and achieve your financial goals. The ability to target specific factors can make it tempting to make finding the “right” factor the basis of your investment decisions. Nobody has the goal of arbitrarily reaping the returns of a specific asset class or premium, even if the returns of that asset class are higher than a simple, passive, total stock market portfolio. Asset classes with different characteristics should all be used to construct a sensible, low-cost, globally diversified portfolio that aligns with your goals as an investor. But too often people get lost in the ability to target higher expected returns, and take risks they don’t need to take. The decisions you make when building your portfolio should reflect the purpose of your financial plan. A well-thought-out financial plan will ensure that your investments put you on a path to financial success, and keep you from arbitrarily chasing asset class returns that won’t have any impact on your ability to achieve your goals.